Back in June of this year, the nice folks at the Wigtown Book Festival invited me to come to their town and give a talk about my book, The Wreck of the Argyll. Now, I’m not at my most comfortable talking in front of an audience – anyone who was at the book launch will be able to attest to that – but I couldn’t turn down this opportunity. In fact, Sandra and I had put Wigtown on our list of places to visit a while back – it is Scotland’s book town, a rival to Hay-on-Wye with its many bookshops. If there’s something Sandra and I can’t resist, it’s bookshops. The fact there was a literary festival, too, made it all the more appealing. To attend, not as a paying customer, but as a writer – I couldn’t say no. As it turned out, Sandra couldn’t make it, so I embarked on the trip on my own, armed only with my trusty satnav and a list of books that Sandra wanted me to look out for – even if she couldn’t make it, I’d act as her book-buying proxy! The Wigtown people really make you welcome. They booked my B&B for me, and when I arrived I was really impressed – Hillcrest overlooks some beautiful views. When I checked in with the festival staff, I was given a goodie bag of local delicacies like cheese and oatcakes and preserves, along with an author pass for any events I wanted to attend. I wandered around the bookshops, bought a couple of books, then settled in for the evening – I wanted to look over my notes for the next day. It was a bit of a grey and cold start, a bit of a change from the previous week of bright and unseasonably warm weather. My event was at 11:30, so I had time for another visit to the Writers’ Retreat for coffee and WiFi before heading off to the primary school. All the event volunteers were lovely and made me completely at home, putting me at my ease when I admitted it was my first event. I sat in on Greg Norminton, who was giving a talk and reading to younger children about his new translation of The Little Prince – despite a croaky throat, he did a superb job, with a brilliant reading and keeping the kids engaged (despite the presence of many cushions on the floor that were a terrible temptation to kick for some of the kids…) so I took some mental notes on how he performed his event. Then it was time for me to get ready for my event. The Wigtown people had been in touch before I drove up, making sure I’d have everything I needed in terms of equipment, and checking my PowerPoint presentation to make sure that it worked OK. There’s nothing worse than turning up on the day with a crucial presentation on a duff USB stick! 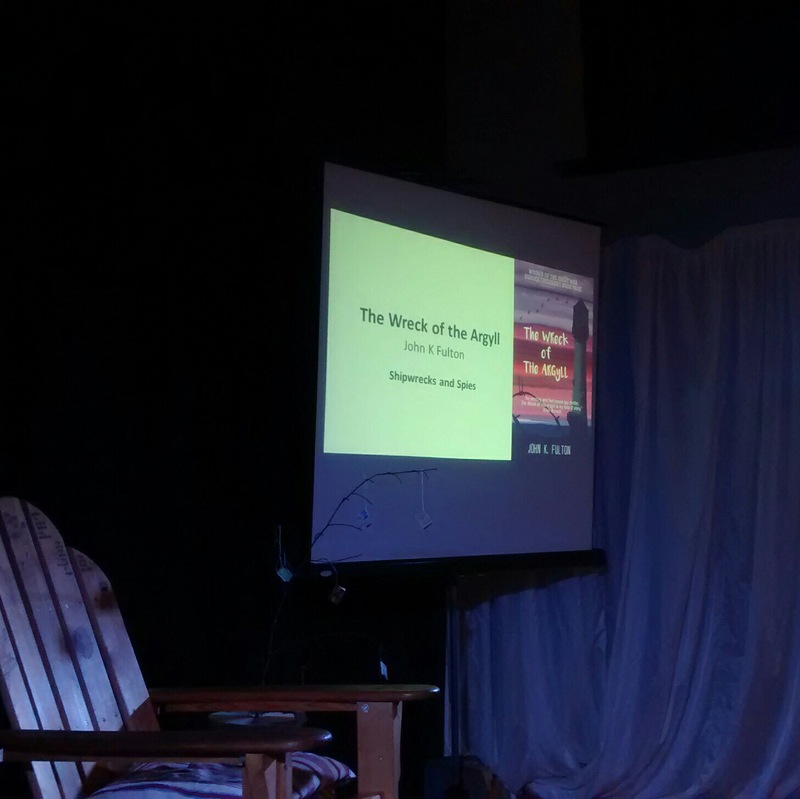 Like with everything else that Wigtown does, my event was set up smoothly and with no problems – the PowerPoint display was already on screen when I walked into the hall. A sip of water, a flick through my notes, then it was time. I think it went OK, for a first-ever event. It perhaps was a little bit short – about 35 minutes, when I’d been allocated an hour. There were a few questions from the audience, too – Wigtown kids are a bright bunch. Then it was over. I signed a few copies of my book, then had a wee sit at the signing desk to calm down after the excitement. 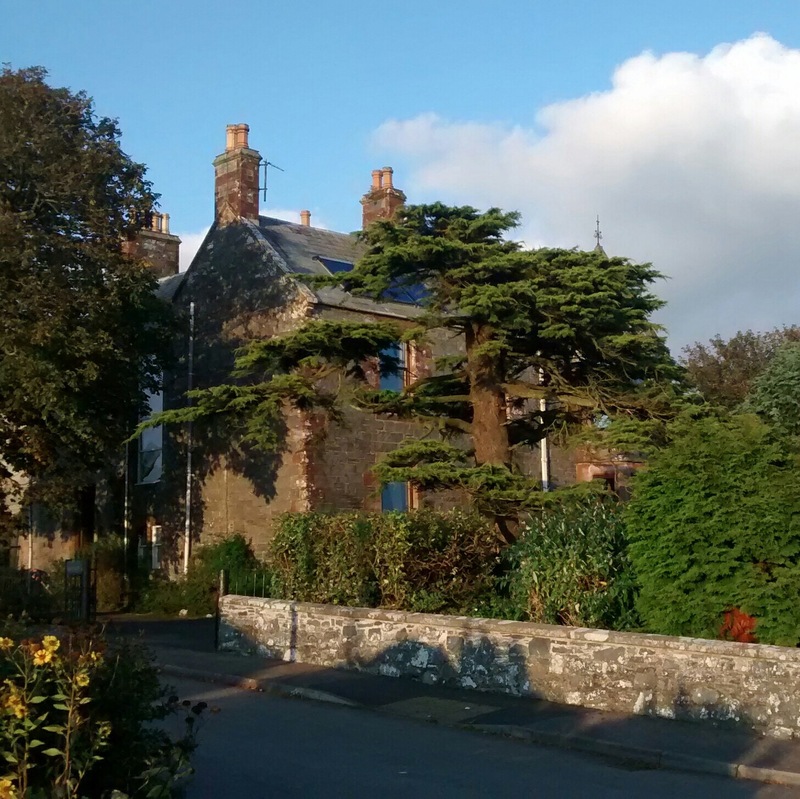 Back to the Writers’ Retreat – my favourite place in Wigtown – for a coffee and some soup, and to email Sandra to let her know how it had gone. I popped into the Festival Bookshop – the big tent in the square – to look for a couple of books. I’d tried to get in the evening before, but Alex Salmond was doing a mammoth 90-minute signing session, so it was impossible to move. 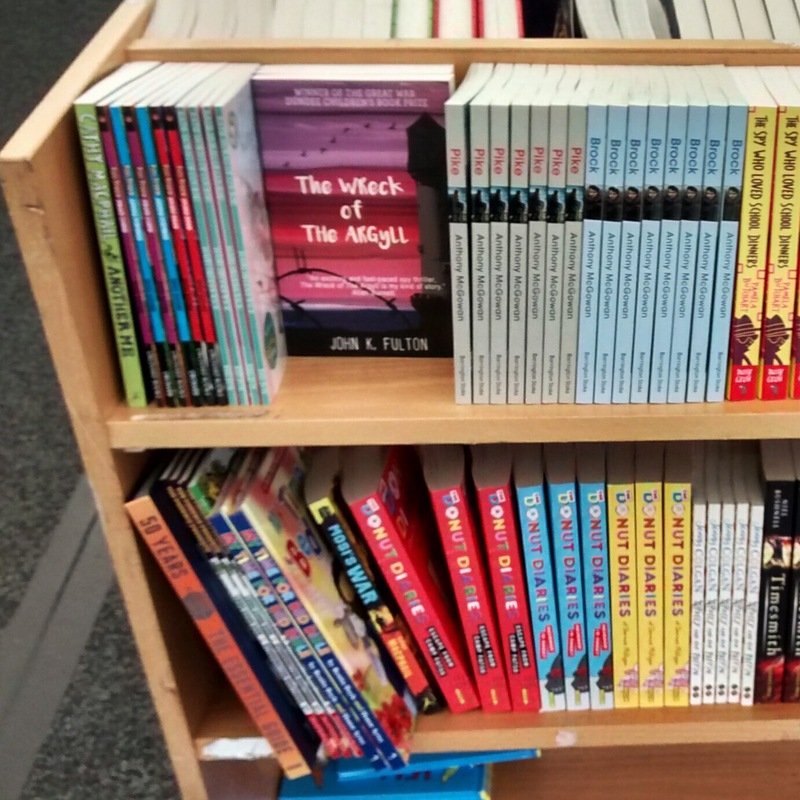 I picked up a copy of Island of Dreams by Dan Boothby for Sandra, and a copy of Kirsty Logan’s short-story collection The Rental Heart, then had a quick peek in the children’s section. There it was! My book on the shelves. (Admission – yes, I turned it face out before taking the picture. I’m a bad man.) When I popped back in later on, the three copies had gone down to two – so there was at least one sale from the festival bookshop. Finally, I used my author pass to get into Stuart Kelly’s talk about imaginary places in Scottish literature – it was excellent, although I do wish that when he was asking for suggestions as to which topic to cover, someone had said “Alasdair Gray” more quickly than the chap who shouted out “Grassic Gibbon”. The sun came out for the first time that day to bathe Wigtown in a beautiful sunset – a fitting end to a great day. It’s a brilliant festival, superbly run, and well worth the drive out into the wilds of Galloway.